St. James Town has existed since the 1870’s, it was originally an upper middle class neighbourhood adjacent to Cabbagetown composed of Victorian style houses. In 1953, the city of Toronto approved a rezoning strategy for the city’s downtown core. This restructuring separated St. James Town from Cabbagetown and with more land it became an important target for developers. The Victorian homes were demolished and groundwork laid out for the construction of multiple high rise apartment buildings in the 1960’s. This first high rise apartment complex in Toronto and was aimed at the middle class professionals, and singles. Presently, St. James Town consists of 19 high-rises, two 4 story residential walk up rental buildings, and a mixture of semi-detached homes all on 32 acres of land. 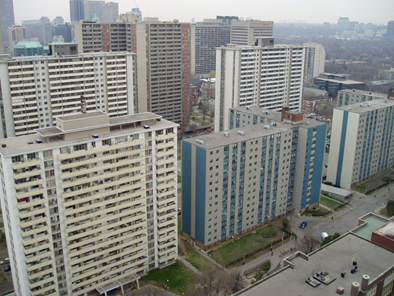 Unfortunately the apartments lacked any appeal to this demographic, as there was a movement by the middle class to move to single homes outside of the city in Scarborough, Etobicoke, and North York. St. James Town is home to many recent immigrants, and is seen as an arrival city; approximately 45% of the residents of St. James Town are recent immigrants. 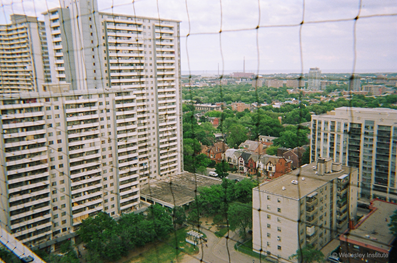 All of the original towers are still standing and in 2010 were home to 17, 832 residents. This number, based on the census, is disputed by many area residents, who believe there to be around 25,000 people. In any case, St. James Town Canada’s most densely populated community, with a density that is 18 times that of the rest of the city. The Wellesley institute has conducted extensive research on overcrowding in the area and found it is due to the small single room bachelor apartments that make up the majority of the apartments. These small apartments are now being occupied by families. The 50 year old buildings themselves are in need of serious repairs. The area also lacks any public space. This is due to how the area was initially developed.It was planned to be a place for singles and middle class professionals, so it was expected that with few children in these apartments, amenities like playgrounds and parks were not required. Future redevelopment plans for St. James Town are currently being considered. One plan that was put forward by the city of Toronto in 2010 focused on creating more public space, implementing new facilities including a clinic, daycares, a library, improving pedestrian connections to the subway , and rehabilitating the high-rise apartments in the area. As of 2014 this plan has yet to be implemented. Other plans that have been put forward include demolition of four of the towers and replacing them with new four new skyscrapers with upwards of 46 stories. Residents of the area are not happy with this idea, as it will only add to the problem of overcrowding. Most of the residents believe that public resources such as a community pool, clinic, green spaces, and a neighbourhood center would be a better idea. These residents want St. James Town to have many of the amenities of Thorncliffe Park.